Valentine’s Day is on its way and we’ve found some brilliant gift ideas for sharing the love around at your place. 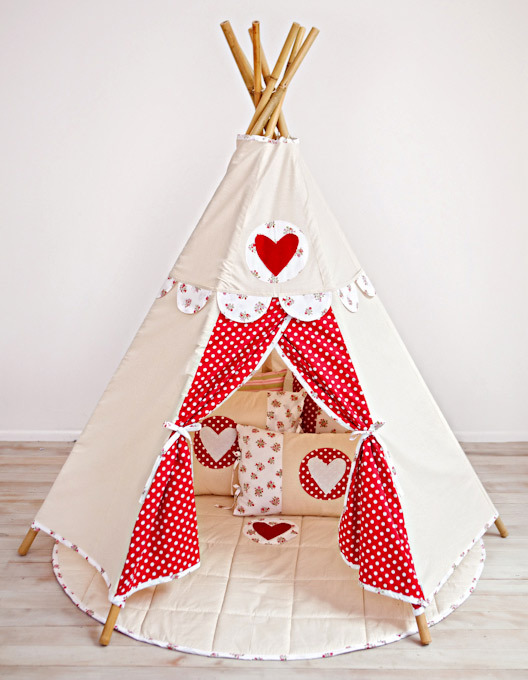 Create a cosy Valentine’s Day nook – then enjoy it every other day for the rest of the year – with this so-adorable-I-just-have-to-squeal teepee from Henry’s House. The teepees are made in Australia from calico and cotton fabrics. Basic teepees start from $295 and you can add matching cushions, bunting and soft playmats to create a playspace to launch a thousand sweet daydreams. 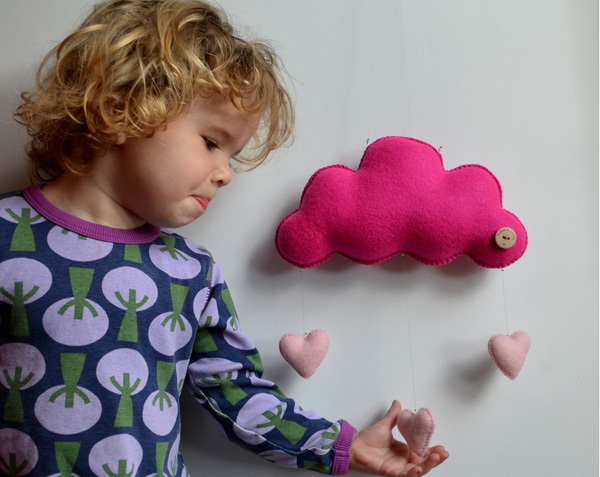 Love is in the air – most literally – with this sweet cloud and heart mobile from Milkbot & Chooky. Handmade from felt, it costs $35 and you can order it via Down That Little Lane in a myriad of other colours if pink is not your thing. If pink is your thing, you’ll be wanting to add this pink heart pillow to your Valentine’s Day must-buy list. 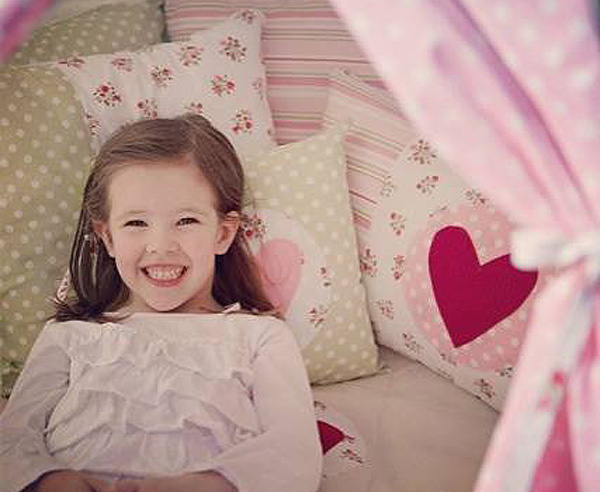 One for the girls in your life – whether baby girl, tween, teen or mum – the Big Love cushion cover comes from Empire Lane Design and costs $39.95. 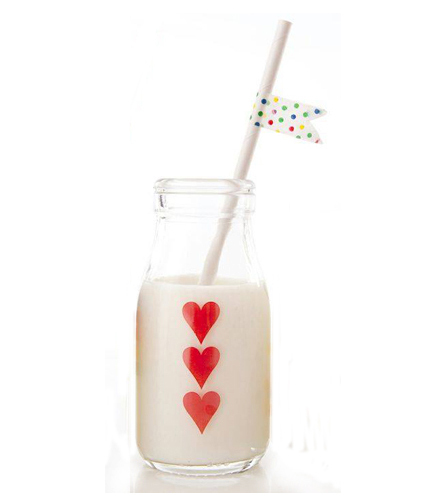 Serve the kids their breakfast milk in these cutesy heart milk bottles for a delightful start to Valentine’s Day. Glass love milk bottles cost $3.30 each from Invite Me. Then ramp up the cuteness factor with matching red heart paper straws, only $6.95 for a pack of twenty-five. 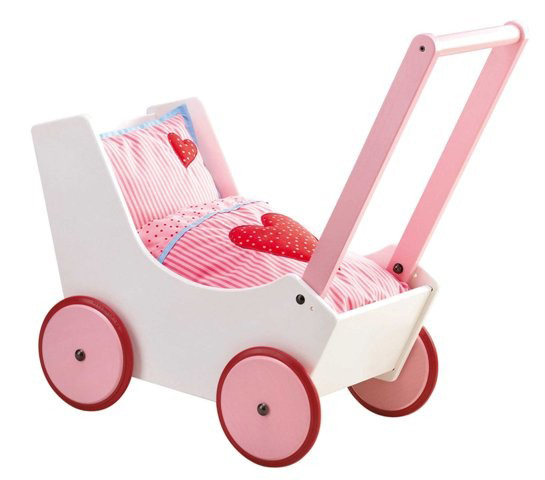 I know that Valentine’s Day is not technically for the kids, but clearly we don’t hold to that adage and neither should you, especially if it stops you snapping up this cute Haba heart dolls pram. The best excuse, should you need one, is that you’re one of those parents (like me) who fell completely and absolutely head over heels in love with your kid the moment you laid eyes on them! The Haba heart dolls pram is made from wood and the perfect size for toddlers and preschoolers. Find it at Entropy for $289. 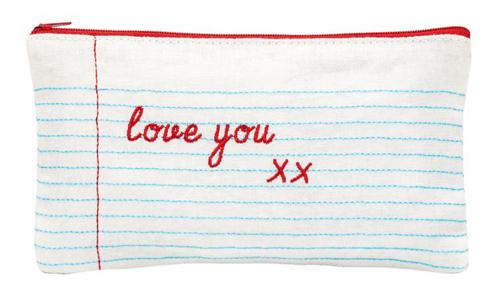 Remind the kids how much they’re loved every time they sit down to do some colouring or homework with this sweet Love You pencil case. Or just snaffle it for your own nappy bag or handbag – I can think of a million things to stash inside. It costs $12.95 from Sussan, with free delivery. How much love will you have to give this Valentine’s Day? How about two-point-five metres of love. That’s the length of this truly sweet heart felt garland from Little Lamb. It costs $39.95 from Lark. 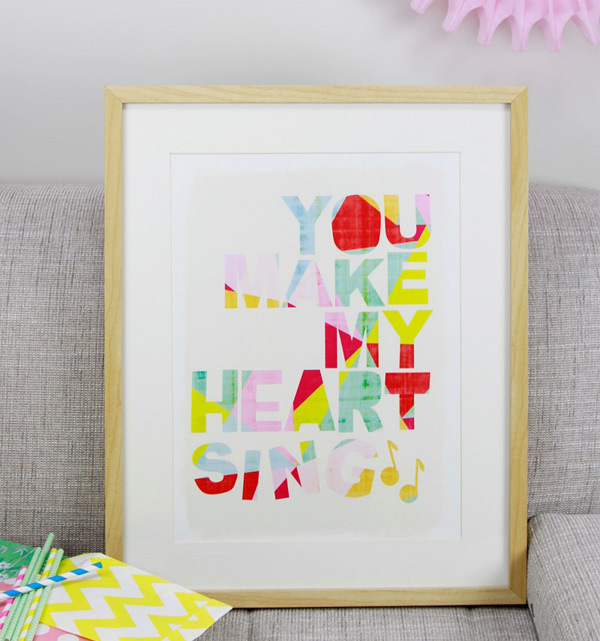 You might not know who sang it, but we’re sure you all know the lines to the tune that inspired this particular art print, You Make My Heart Sing. A limited edition of fifty, this one is designed and printed in Melbourne. Find it at White Forest Home for $59.95. Does your Valentine have a heart of gold? Then we’ve found the perfect thing for them. 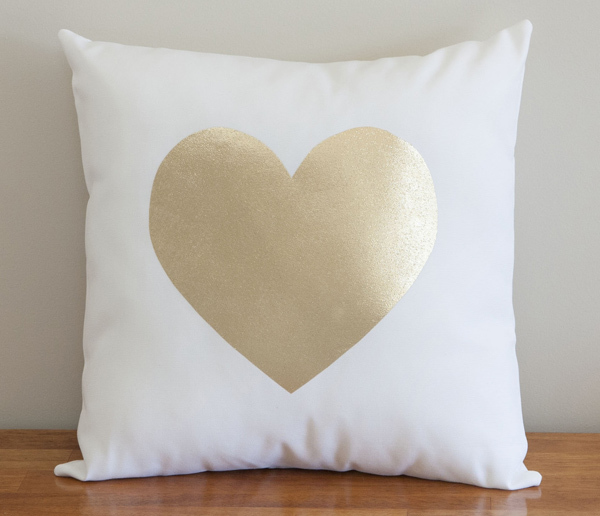 The Gold Foil Heart cushion, from Queensland’s Max & Me Homewares, will put just the required level of fancy heart-shaped bling in the nursery or bedroom. Get your own gold heart at Down That Little Lane for $45. 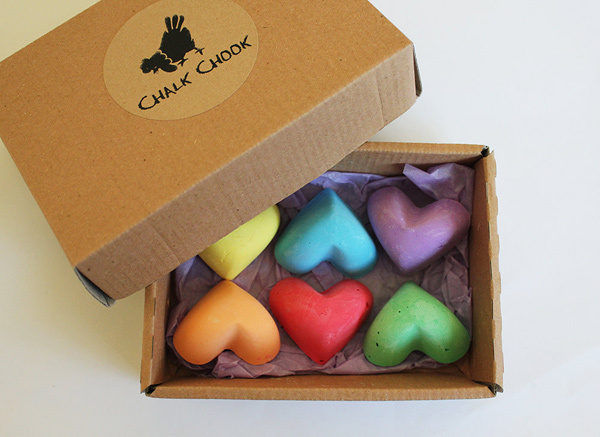 Or let the love flow with a set of heart chalks from Chalk Chook. Grab a set of six different coloured chalks for $9.95 plus post and set the kids loose to decorate the footpath and fences at your place.